Moving from Joure via Heeg to the Sloten Slotergat dyke on a sunny, but windy day, during which time we completed our washing and recharged our batteries . This was a well-organised day that brought us along several canals and across four meers, to firstly stop off at Heeg to take advantage of free water and electricity with which to use our washing machine and recharge Lady Martina with both, before cruising on to approach Sloten and moor up in its Slotergat dyke for the evening. We had exhausted our €5 card with electricity demands and the red light was on my inverter when I finally started the engines and the batteries gained some charge at last. We were also low on water and so were looking out for a supply when we set off from our Joure Passentenhaven, but they were all requiring a Sep card with funds to operate. 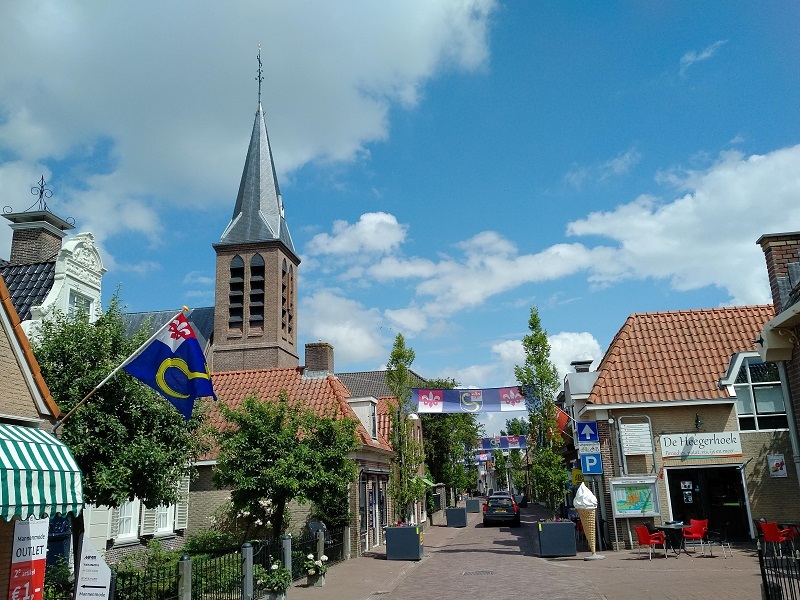 It was windy this morning, but that did not worry us as we completed the trip along the Jouster Sylroede, turned left after passing through the open Joustersluis and headed in a south-westerly direction across the Langwader meer. It was wide open, with white horses breaking the surface in the fresh breese, as we made our turn near the end and headed Northwest towards the Langwarder Feart, but then turned south-west again before we got there, to leave the meer and clear the Ophaalbrug opening bridge. 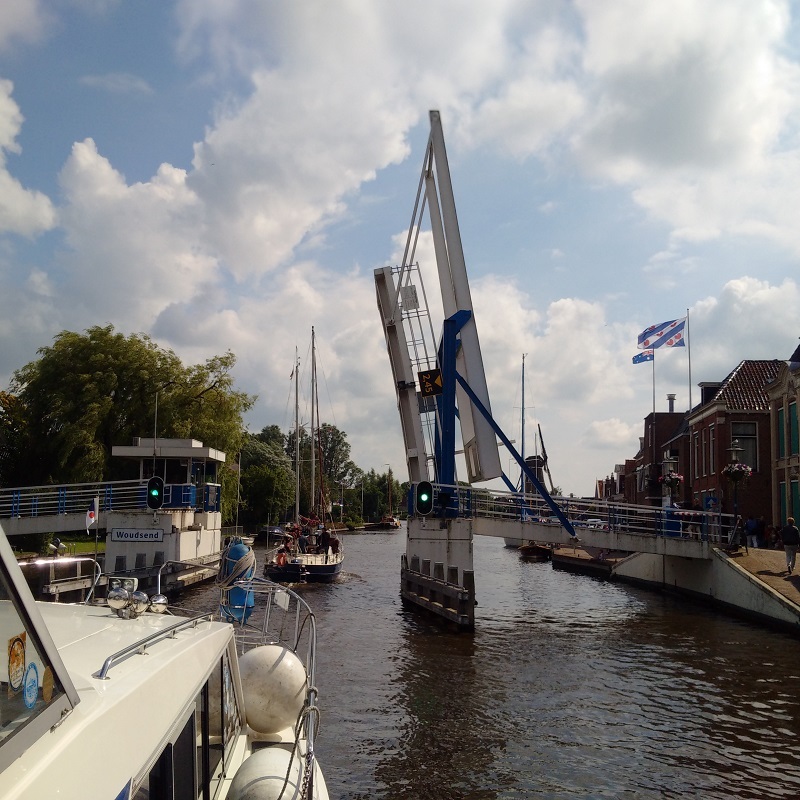 This let us enter the Jaan Sleat, which took us into the northern extremity of the Koevordermeer, where we were then able to overtake a string of slower sailing boats that had been hampering our progress. As soon as we crossed the Princes Margriet Kanaal, we turned north on it briefly, before finding the Johan Frisokanaal to port for the long westerly slog towards Heeg. On the previous occasion we had tried to moor in Heeg, there was no space but, it being earlier in the day, I pulled in alongside and, resisting the ministrations of the young seasonal harbourmaster, got us moored against a strong off-shore breeze. Once secure, we then explained our plan to just stop for water, rather than overnight, and we were then left to our own devices and I then spotted that the electricity pods and one water point were permanently on rather than requiring 50c pieces! This then allowed us to complete showers and hairwashes for ourselves and two full cycles of our washing machine for our clothes and still end up with full water tanks and fully-charged batteries free! As Kathleen was organising the washing and cleaning the inside of the boat, I took a walk to the centre of Heeg, which is well-served with restaurants and bars, but the shops were mostly closed, it being Sunday, and so I could find no bread to buy. Once back, a further half hour cleaning the hull, as I could reach the starboard side for once, and then we left for the second half of the day’s cruise. This involved cruising south across the Hegermeer and Slotermeer in that fresh breeze and passing through the little village of Woudsend in between before cruising into the sheltered Slotergat, where we found grassy moorings just out of the town of Sloten with 10A electricity and WiFi to make us comfortable for the evening. 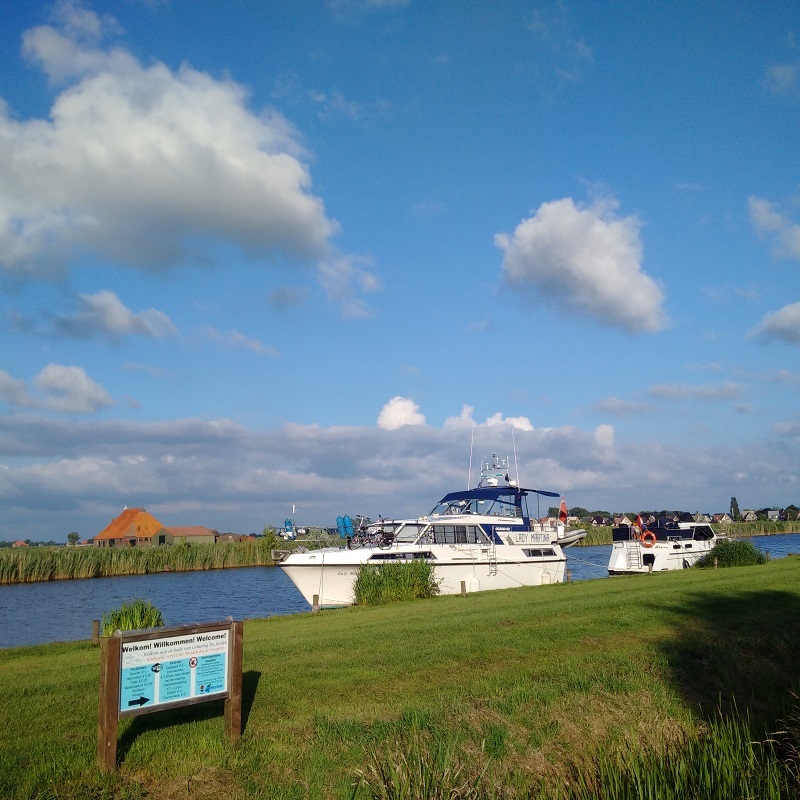 By now the sun was shining brightly and the breeze was dropping for the night and so we celebrated a fantastic cruising day with beers and enjoyed the open landscape and the peaceful scenic nature of the place.